For the first time in nearly three centuries, a family of endangered Hawaiian state birds are calling Oahu home -- temporarily, reports CBS affiliate KGMB. The U.S. Fish and Wildlife Service says that a pair of nene have nested and hatched three goslings at the 1,100-acre James Campbell National Wildlife Refuge. "It's very exciting to have them here and to have nested and to have raised goslings in an area where they haven't been in so long is very historic," said Annie Marshall, a biologist and nene expert, told local Fox affiliate KHON 2. "This is the first time that we have seen nene here since Westerners started documenting the bird and native wildlife population." Greg Smith, the director of the Patuxent Wildlife Research Center, told KHON 2 that the nene were first observed on Oahu around Jan. 9. The pair of nene were first spotted at a local country club in early January, where they spent a week along the fifth hole. Observers said they were very tame. It is illegal to make contact with the nene, but the geese would get so close to members that people were able to read the tags. Identified as K-49 and K-60 by the tags they wore, they were originally from Kauai, and then relocated to the Hawaiian island, according to KGMB. They may have been on the way home for the mating season, when they made an unexpected stop on Oahu. "They were on and off at the refuge, and then we saw them hanging out here for a while and we saw them picking out a spot," Smith explained to KOHN 2. Out of the four eggs that the female nene laid in February, three hatched on March 13. Scientists believe that once the goslings are old enough to fly, they will head back to Kauai. If they do, Marshall hopes it won't be another three centuries before they visit Oahu again. 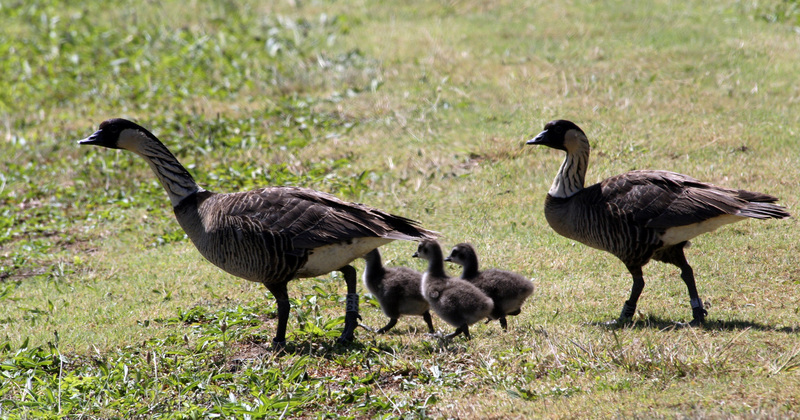 The Hawaiian goose, or nene, were driven to near extinction in the 1950s. Only 30 birds were left in the world -- all on Hawaii Island. The U.S. Fish and Wildlife Service say the Hawaiian state bird may be on the verge of making a comeback. Statewide totals are now estimated to be 2,500 birds on the islands of Hawaii, Maui, Molokai, Kauai and Oahu, with some moving to new areas on Hawaii and Maui, where they were not seen previously. It is unknown what exactly caused the dwindling numbers in Oahu, but there could be several contributing factors, such as the introduction of mammal predators -- feral dogs and cats, mongoose and rats, Fish and Wildlife biologist Aaron Nadig told the Fox affiliate. It is possible that more birds will arrive on the island, particularly in national wildlife refuges. Officials don't plan on moving any birds, hoping that they will find their way naturally.